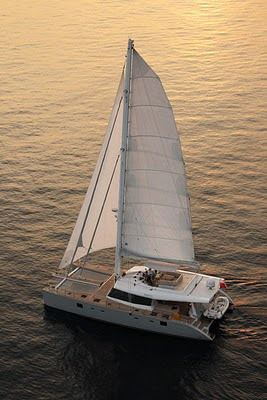 Miss Kirsty is a stunning sailing catamaran, giving an exquisite and memorable experience, heralding a new dawn in luxury yachting. Recently launched, she boasts the very latest concepts in technology and has exceptionally desirable high end living comforts. With substantial living space, twice that of an equivalent motor yacht and with an extensive range of watersports equipment, she also benefits from a shallow draft, allowing you to experience even the most remote tropical beaches with only a short swim. If you are looking to explore landfall, our caring crew are there to help, making sure you enjoy the experience to the full, whether on land or at sea. But that is not all; Miss Kirsty achieves all of the above with a minimal carbon footprint, taking our guests from one beautiful destination to another with minimal damage to our environment. So whether you dream of experiencing new places and cultures, fine dining, floating through crystal clear waters or the excitement of watersports. Maybe it is simply watching the stars on clear night in a cool ocean breeze. Whatever you desire, Miss Kirsty has the answer. Click here for more information on charters.